The quality is in the details. The large rolled arms and carved feet give the Bluffton a timeless appeal that will last for ages. With durable comfort accentuated by coil spring cushioning, this is a recliner you won’t want to pass up. The Distressed Pecan or Antique Black finish options on the bun feet will complete the look of your new favorite recliner. With over 700 fabric covering options, you will be able to pick the perfect neutral for a clean palate or a timeless pattern that will add a dash of dimension to the room. 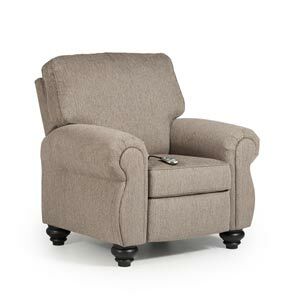 This Best Home Furnishings recliner is available as a standard pushback or recline all the way back at the simple touch of a button with the power option.